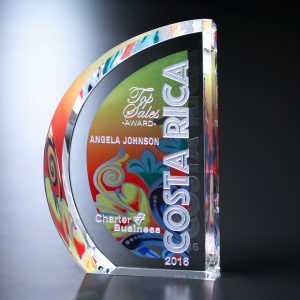 You can create a beautiful and one-of-a-kind crystal award or gift using our versatile and innovative Illumachrome™ process. 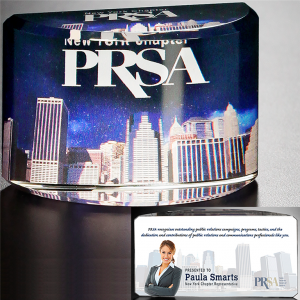 The Illumachrome™ process allows any 4-color photo or artwork to be applied to many of our crystal awards and gifts. The process is extremely detailed and captures locations, landscapes, and highly detailed imagery with precision and ease. 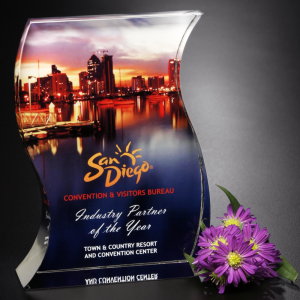 This imprint process complements occasions like a sales incentive, an event commemoration, or a product launch wonderfully. Here are a few more ideas to inspire some creativity! When two businesses merge, the event can be memorialized with an award featuring the new name of the organization, multiple logos, date of the merger, and signatures from the respective owners. Similarly, a new product can be memorialized with Illumachrome™ pictures by capturing the release date and names of the product developers. This fits large-scale industries like pharmaceuticals, technology, or entertainment well. The imagery of a new building commitment or commemorating of the addition of a new wing, along with the established date, make this occasion unforgettable. Everyday scenes common to the specific work that together makes up a career such as the imagery of a firefighter fighting menacing flames, a pilot boarding the jetway, or chef plating a delicious meal. All of these occasions are important and meaningful to the people who will receive an award and help establish a personal connection that only a recognition award can! To download the Illumachrome™ flyer, click here.